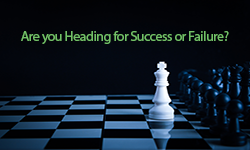 Are You Headed for Success or Failure? You need sales of $1,000,000 in 12 months. Your average sale is $25,000 so you need about 40 sales. Typically you close 20% of the accounts you prospect. Most sellers know what their revenue goal is. You can find the average spend per account by taking your total revenue for the period and dividing by the number of accounts that spent in the period. What is interesting to us…most sellers don’t know their close ratio. This isn’t surprising really. Unless you’re keeping track in a spreadsheet or CRM there really wouldn’t be a way to know. No more do you have to dwell in the darkness, guessing at how many accounts to pursue! Ask us how to track your close ratio in Matrix. Meanwhile to estimate how many accounts you need in your pipeline reflect back on last quarter, how many accounts including prospects did you work on – even if you didn’t get a sale? How many did you ultimately close? Divide the number closed by the number attempted and you’ll have a good estimate of your close ratio. Taking a little time to understand your closing ratio and then applying that to proactively plan your efforts is a key step in ensuring you have enough potential dollars at the top of the funnel. You are planning for success. If there isn’t enough going in at the top there will certainly not be enough coming out.